Crest Pro-Heath HD is bringing your smile Crest’s biggest breakthrough in toothpaste since fluoride, with a new daily two-step system. Designed to enhance your oral care routine, it’s formulated for deep cleaning and advanced whitening that goes beyond your normal toothpaste. With just two minutes of brushing, your mouth will actually feel the difference from first use. Upgrade your routine for 6X Health Improvement and 6X Whitening in 1 Week, and smile like never before. Step 1: The Purifying Cleanser contains the active ingredient stannous fluoride that deep cleans, strips away plaque and helps reverse gingivitis while fighting cavities. Step 2: The Perfecting Gel is formulated with hydrogen peroxide to whiten and polish teeth by removing surface stains, leaving your mouth with the ultimate clean feeling. Flash a brighter, more luminescent smile. Isolated ingredients work at their full potential to provide you with 6X Health Improvement & 6X Whitening in 1 Week. Studies show that plaque is reduced by 35% and bleeding sites, a measure of gingivitis, are reduced by 43%. The Perfecting Gel’s focused whitening power gives your teeth the ultimate clean feeling. Achieve the healthier, more luminescent* smile you deserve. Question: Why is Crest Pro-Health HD better than regular toothpaste? Answer: Crest Pro-Health HD is Crest’s biggest breakthrough since fluoride. The daily two-step system provides you with 6X Health Improvement & 6X Whitening in 1 Week. Studies show that Crest Pro-Health HD reduces overnight plaque by 35%. And reduces bleeding sites, a measure of gingivitis by 43%. The hydrogen peroxide provides additional whitening. 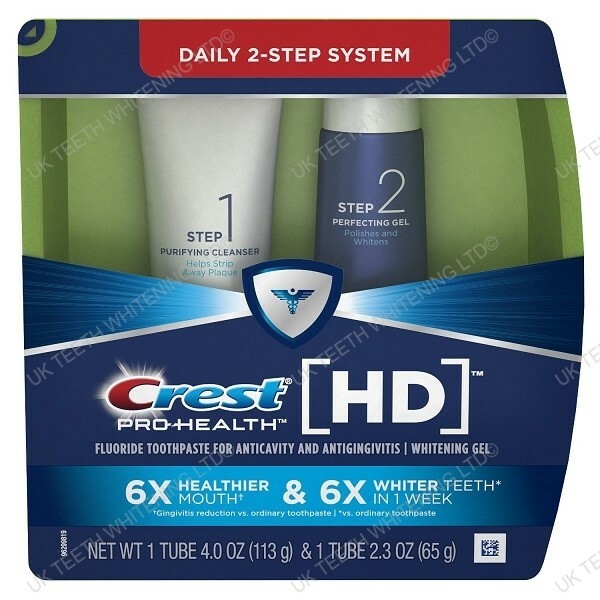 Question Why does Crest Pro-Health HD have two steps? Answer: Crest Pro-Health HD is a breakthrough, daily two-step system that offers a noticeable and different experience that improves both the oral health and appearance of your mouth. By isolating key toothpaste ingredients, it allows them to each work individually so they can perform at their peak, giving you an experience that lets you feel the difference from first use. Satisfaction guaranteed. Question: How do the two steps work? Answer: The first step is a Purifying Cleanser. Brushing with the Purifying Cleanser for 1 minute helps strip plaque away for a deep clean. When finished brushing, you may spit; however, do not rinse before beginning Step 2. The second step is a Perfecting Gel that polishes and whitens. Brushing with the Perfecting Gel for 1 minute helps whiten teeth by polishing away surface stains. When finished, rinse out your mouth. Using both steps together for just two minutes gets you a healthy, luminescent* smile you can feel from first use. Note: You may experience a dry feeling after Step 1. This lets you know that your mouth is fully prepared for Step 2. Question: How do I use this product? Answer: Crest HD is used for two minutes and twice daily. Use Step 1 for one minute, followed immediately by Step 2 for an additional minute. It’s not recommended to use either of the steps without the other, or in combination with other toothpaste products. This helps avoid running out of one step before the other. Warning Keep out of reach of children under 12 yrs. of age. If more than used for brushing is accidentally swallowed, get medical help or contact a Poison Control Center right away. You may experience temporary signals with the use of this breakthrough system, such as: white spots on gums, or other soft tissue, and/or oral discomfort. These signals are temporary, and not harmful. If oral discomfort persists, discontinue product use.